Don’t wait for schools to be built. Teach the children under the nearest tree. 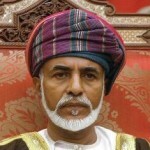 Qaboos bin Said Al Said is the Sultan of Oman and its Dependencies. He rose to power after overthrowing his father, Said bin Taimur, in a palace coup in 1970. He is the 14th-generation descendant of the founder of the Al Bu Sa'idi dynasty.